Quick Fix: Making That First Down Payment. I managed to make my down payment today! I was worried I wouldn't get the time to gather the 10k bells. But with a few lucky fish while hanging out at my grandmas like we do every Sunday, I managed to snag just enough to finish it off. 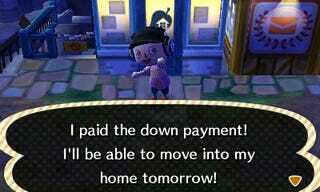 How many of you guys managed to pay your down payment before nook closed shop at 8 pm?